The Jacobite Syrian Christian Church is a part of the Universal Syrian Orthodox Church under the holy apostolic see of Antioch and all the East which was established in A.D. 37 by St.Peter, the head of the apostles. The Supreme Head of the Church is Moran Mor Ignatius Zakka I Iwas, Patriarch of Antioch and All the East with the Catholicos of India, His Beatitude Baselios Thomas I as the local head. The history of the Jacobite Syrian Church in the United Kingdom can be traced back to the 1970’s when our faithful from Kerala arrived here for job related opportunities. In those days there were hardly any facilities for the limited number of our faithful to take part in the holy mass or to assemble together for prayer. The spiritual needs of our faithful were met from the nearby parishes of our sister apostolic churches. The visit of H.B. the Catholicos to the U.K. lasted for two weeks. During that blessed occasion, the Catholicos visited the major churches, cities and universities in the U.K. and had cordial discussions with prelates of sister churches regarding the liturgy of our church and making arrangements for our faithful to attend mass in various places. His Beatitude paid visits to the renowned universities at Oxford and Cambridge and also toured the city of London. The Catholicos was accorded a warm reception at the Canterbury Cathedral, the headquarters of the Church of England, by the Dean and Chapter of the Cathedral. After prayers at the Cathedral, His Beatitude held round table discussions with the Anglican bishops and dignitaries. After a guided tour of the cathedral and its premises, His Beatitude thanked his hosts and concluded his visit to the Anglican Church headquarters. The epitome of simplicity that His Beatitude was, the Catholicos spent a day with the faithful who cordially received him and exhorted his beloved spiritual children to uphold our traditional Christian values and the true faith. The Catholicos concluded his first visit to the U.K. and returned to Malankara after which H.B. sent a Bull to the faithful in London, thanking them for their love and hospitality. It may be graciously recalled that the travel and media arrangements during the visit of the Catholicos were overseen by Shri Chandy Thomas. Ever since that first holy service, the prayerful wait of the faithful to attend a holy qurbono got realised at periodic intervals when the late Metropolitans, Thomas Mor Osthatheos, Philipose Mor Ivanios and Kuriakose Mor Coorilos of blessed memory, celebrated the mass during their respective visits to the U.K. The long cherished dream of our faithful to have a regular service bore fruit with the arrival of Fr. Jose Pallathitta (now H.G. Joseph Mor Gregorios) to Ireland for higher studies. As directed by H.B. the Catholicos through a kalpana, Fr. Jose convened a meeting of the faithful in London and in April 1989, a congregation comprising seven families was formed in the name of St. Thomas, the apostle of India, at St. Mary’s Church, Aldermary at Queen Victoria Street in London. Thus was born the first parish of the Jacobite Church in the U.K. The selfless services of the Fr. 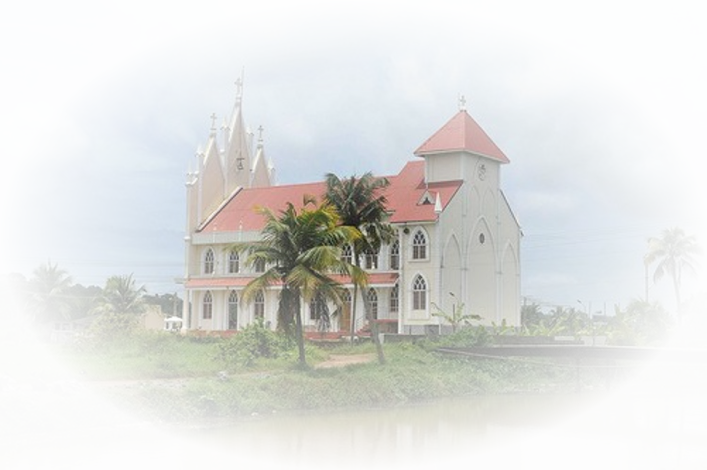 George Vadathu in making all the necessary arrangements for the parish is kindly recalled .Thereafter holy services were regularly conducted every month, during Christmas, the Passion week and major feast days in the fledgling parish. Holy mass was also offered by H.G. Dr. Abraham Mor Severios in 1992, H.G. Dr. Thomas Mor Themotheos in 1993 and the Very Rev. Ramban Aphrem Kareem in 1994 during their respective visits to the U.K. After Fr. Jose Pallathitta left for the U.S.A. in 1992 for higher studies, the spiritual needs of the faithful were catered to by the Rev. Fr. George M. Vadathu and later on by Rev. Fr. Joseph Kulatharamannil. In 1994, Fr. Jose Pallathitta was ordained by the Patriarch of Antioch as the metropolitan of the diocese of Kochi and was also appointed as the first Patriarchal Vicar for the Malankara Jacobite Syrian Christians in Europe. In 1992, Mr. George Mathew Nalunnakkal (the present Patriarchal Vicar Mor Coorilos Geevarghese) had also come to England for his doctoral studies. He assisted Fr. George Vadathu in the Sunday services in London. He returned to India in1995 after successfully completing his Ph.D from the University of Kent. H.G. Mor Gregorios visited various places in the U.K and strived tirelessly to establish new congregations. By the year 2000, the influx of our faithful to various parts of Europe in general and to the U.K. in particular increased dramatically. It was around this time that Rev. Fr. Job Thottathil (now Job Mor Silvanios), of the Knanaya diocese arrived in England for higher studies and was entrusted with the responsibility of catering to the spiritual needs of various parishes. Subsequently, Fr. Raju Cheruvallil and Fr. Siju Varghes arrived in the U.K. Fr. Raju was appointed as the vicar of the church in London. Thereafter, with the blessings of the diocesan metropolitan, Mor Gregorios, new congregations were established in Portsmouth, Birmingham and Belfast. Fr. Cheruvallil was instrumental in starting new congregations in Liverpool and Eastbourne. In the year 2003, H.G. Dr. Kuriakose Mor Theophilos, the resident metropolitan of the MSOT Seminary was appointed as the new Patriarchal Vicar of Europe by the Patriarch of Antioch. H.G. Mor Theophilos who had studied in Germany, travelled widely throughout Europe and made necessary arrangements to start new parishes at various places. With the blessings of the new diocesan Metropolitan, Fr. Siju Varghese provided able leadership in forming new congregations in Manchester, Bristol and Northampton. During his visit to the U.K. in 2005, Mor Theophilos elevated the congregations in Liverpool, Manchester, Portsmouth, Birmingham and Bristol to the status of parishes. Mor Theophilos pioneered the organisation of a Family Conference for the Patriarchal Vicarate of Europe which was held successfully in Vienna, London and Switzerland in successive years from 2005 onwards. Mor Theophilos also constituted a council for the Jacobite Church in Europe. The arrivals of Rev. Fr. Geevarghese Thandayath and Rev. Fr. Jobymon Skaria in 2005, Rev. Fr. Thomas Puthiyamadathil in 2006, Rev. Fr. Benny Thomas in 2007 and Rev. Fr. Peter Kuriakose in 2008 facilitated the regular conduct of church services in Liverpool, Manchester, Bristol, Belfast and Newcastle. As the number of parishes in the U.K. increased to twelve, H.H. the Patriarch of Antioch accepted the recommendation of the local Episcopal Synod in India and carved out a new Patriarchal Vicarate of U.K. separate from the rest of Europe. H.H. the Patriarch appointed H.G. Dr. Geevarghese Mor Coorilos , the Metropolitan of the diocese of Niranam as the new Patriarchal Vicar of U.K. in July,2008.H.G. Mor Coorilos had pursued his Doctorate in Theology in England and is renowned internationally as a scholar and champion of the ecumenical movement. Mor Coorilos visited the U.K. in January, 2009 and was accorded a warm welcome in various parishes across the vicarate. H.G. Mor Coorilos convened a joint meeting of the vicars, parish council members and church laymen representatives at St. Johns Church, Bethnal Green, London on January 24, 2009 which charted a future course of action for the dynamically growing vicarate. The highlight of the historic meeting was the setting up of an administrative body called the” MSOC Council U.K.” and the decision to start new congregations in Aberdeen, Oxford, Leeds and Londonderry. H.G. successfully led the initiative to organise a Family Conference in the U.K. and started a census of all the Jacobite faithful in the U.K. The discipline and administrative acumen of H.G. Mor Coorilos has undoubtedly transformed the United Kingdom into one of the most rapidly growing Patriarchal Vicarates of the Church. The Patriarchal Vicarate has entered into its golden era in this Jubilee year. As it tides over many crises, this dynamic vicarate with sixteen parishes unitedly marches forward under the able leadership of its Patriarchal Vicar and various priests ,steadfastly affirming its unflinching loyalty to the holy throne of Antioch and pledging to adhere to the true apostolic faith. “Ye have not chosen me, but I have chosen you, and ordained you,that ye should go and bring forth fruit, and that your fruit should remain:that whatsoever ye shall ask of the Father in my name, He may give it to you.”(John 15:16). The first holy mass by the late lamented Catholicose of the East, Baselios Poulose II, gave the much needed spiritual enlightenment to our faithful in the U.K. The Jacobite faithful in the U.K, by the grace of God and under the bold spiritual leadership of Mor Coorilos Geevarghese, were able to organise a historic family conference in London in September, 2009. This was attended by the Catholicos Baselius Thomas 1, other bishops and dignitaries and also by more than 500 faithful Jacobites. Another major highlight of the conference was the publication of a souvenir to commemorate the silver jubilee of the first ever Malayalam holy Qurbana celebrated in London by the late lamented Catholicos. (please see the separate section on Family Conference and the Jubilee Souvenir). The Syrian Orthodox Church in the United Kingdom has now entered a new age of progress and development. In the midst of this busy lifestyle, our endeavour should be to pass on this beacon of light to our future generations and become proud witnesses to the Christian spirit. Let us all stand shoulder to shoulder and strive together to realise the vision of our predecessors three decades ago who toiled hard and sacrificed a lot to start a service for our church in the shores of the United Kingdom. As the Church marches forward, let us sincerely pray for the setting up of an administrative centre and arrival of more priests for the regular conduct of services in all our parishes.